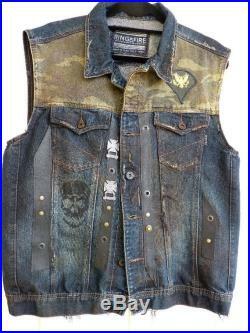 Walking dead inspired distressed denim vest with leather & camouflageaccents - genuine military patches and pinswasteland, post apocalyptic, mad max style, walking dead inspired, rock & roll, goth, punk stylethis ring of fire denim vest has been hand distressed, painted and dyed to give it that post apocalyptic feeling. 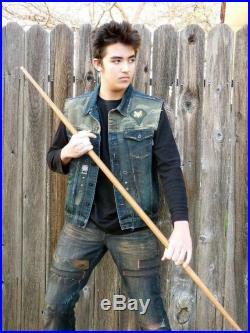 I've added black leather strips to give it great texture. 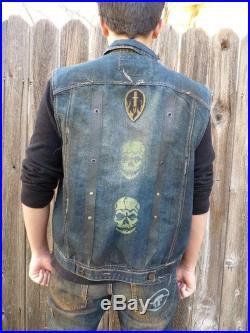 There are 3 painted skull designsand military patches. Also genuine military rifle and grenade pins. Men's size x large - but fits more like a largeone of a kindi do have one more of these vests in a large, but will fit smaller. Convo me if you're interested. 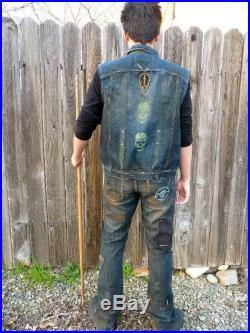 I'm a mixed media artist heart & soul so i will be creating more clothing in this style vests, jackets and pants. 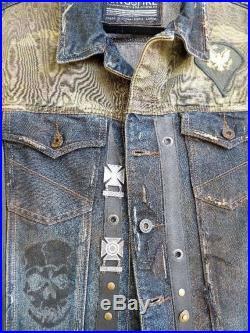 Each one is like a wearable art with so much cool potential. I wanted to create something that could be worn everyday orout clubbing, but also as a base to a wasteland - post apocalyptic style costume.